By now, most Quentin Tarantino fans are aware of the connections interlaced throughout all of his films. John Travolta’s Vincent Vega in Pulp Fiction is the brother of Michael Madsen’s Vic Vega in Reservoir Dogs, Harvey Keitel’s Mr. White worked with Alabama from True Romance, the plot basis for Kill Bill is described as the synopsis for a TV series in Pulp Fiction, etc. Now the epiphany that Eli Roth’s character of Donny Donowitz aka “The Bear Jew” in Inglourious Basterds is the father of the movie producer Lee Donowitz in True Romance has inspired a truly mind-blowing theory that the rest of the films (chronologically speaking) in Tarantino’s filmography take place in a world where [Inglorious Basterds spoiler] World War II came to an end when Adolf Hitler was brutally murdered in a movie theater by the Basterds. Hit the jump for more. 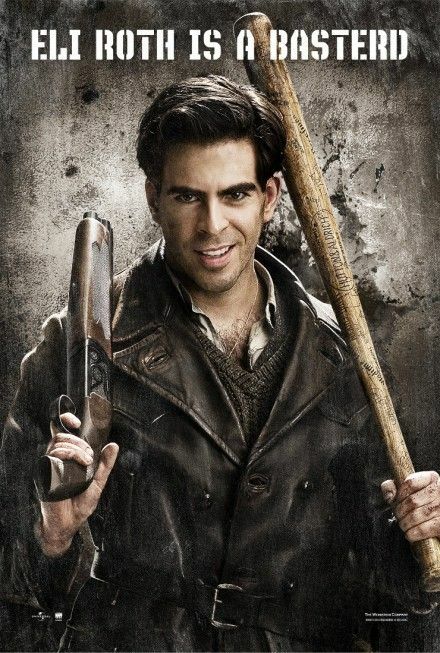 As it turns out, Donny Donowitz, ‘The Bear Jew’, is the father of movie producer Lee Donowitz from True Romance – which means that, in Tarantino’s universe, everybody grew up learning about how a bunch of commando Jews machine gunned Hitler to death in a burning movie theater, as opposed to quietly killing himself in a bunker. What immediately springs to mind about Kill Bill and From Dusk ‘Til Dawn? That they’re crazy violent, even by Tarantino standards. These are the movies produced in a world where America’s crowning victory was locking a bunch of people in a movie theater and blowing it to bits – and keep in mind, Lee Donowitz, son of one of the people on the suicide mission to kill Hitler, is a very successful movie producer. It’s a kind of mind-blowing theory and it definitely brings about another way of viewing the rest of Tarantino’s filmography. The question is, how will Django Unchained fit into this timeline? Will it be in the Tarantino universe or the “movie movie universe?” Could we possibly see an early iteration of the Red Apple cigarettes? Though Tarantino’s first and most important goal is to make a great standalone movie, I’ll be interested to see if/how he throws a connection to the rest of his films into the upcoming Spaghetti Western.